In 2005, I came across three diaries belonging to Raymond Enders, a resident of New York City. 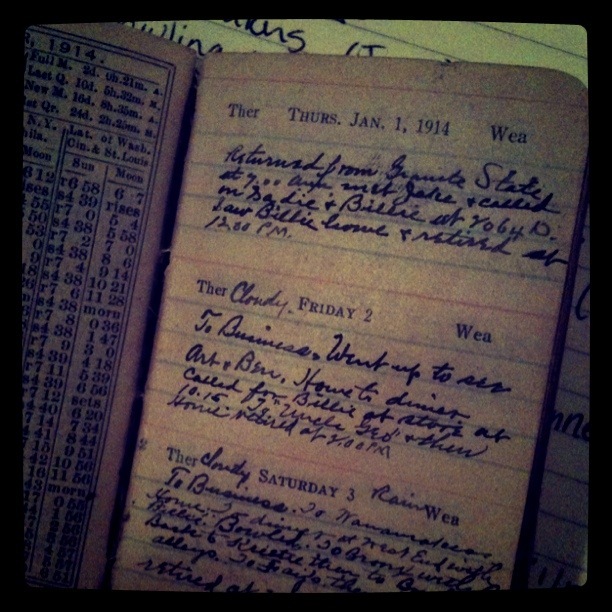 In these diaries (from 1914, 1921, & 1923) he meticulously recorded his daily life. In 2011, I will retrace his steps and share some of the highlights. Saturday, January 3rd: Cloudy. Rain. 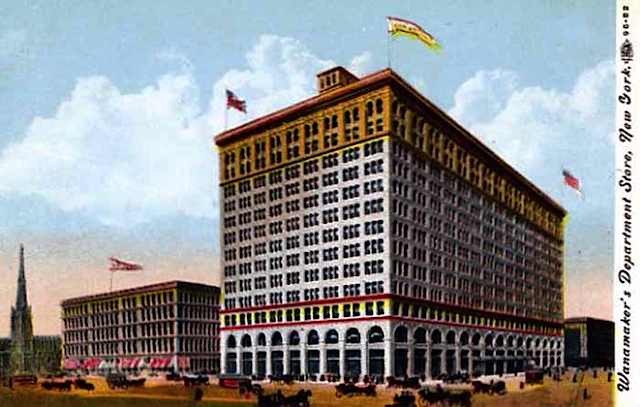 Wanamaker’s was a department store located on Broadway between 9th, 10th streets and 4th avenue. The building has withstood the test of time and a fire that resulted in near ruin to the interior and the subway beneath it. Today, 770 Broadway itself doesn’t look much different, though the street itself is crammed end-to-end with buildings. Wanamaker’s is now home to my local Kmart. Pretty fancy exterior for a discount store. Hans Schmidt was a priest who was affiliated with St. Joseph’s Church on W. 125th street. He confessed to killing Anna Aumuller, dismembering her body, and sinking it in the North River. The NY Times has the story. 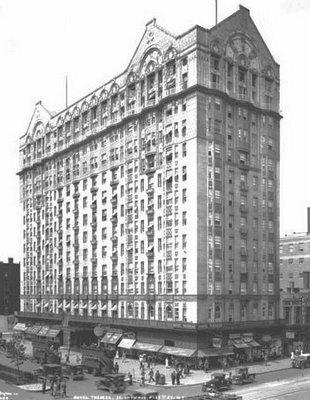 The Hotel Theresa was built at 125th street and 7th avenue in 1913. First opened as an “apartment hotel,” it boasted 300 rooms and a style that the NY Times noted could look Islamic or Art Deco. 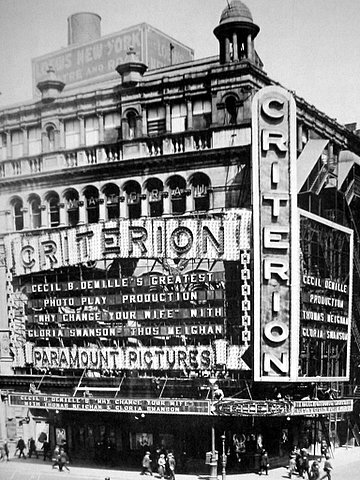 Ironically, the “Wonder of Harlem,” was only open to white people until 1940. By 1941, it was the the place for African-American athletes, musicians, writers, and the likes of Malcolm X. (and even Fidel Castro), passed through the hotel. Sunday, January 25th: Clear. Cold. On January 25th, the show Raymond would have seen is was a comedy called “Young Wisdom” by the playwright Rachel Crothers, who was one of the few female playwrights whose plays were running on Broadway. In her lifetime, she had 37 plays produced, most of which revolved around the themes of women, society and gender politics. All were comedies. The NY Times gave “Young Wisdom” a highly favorable review. Despite the daily records of Raymond’s life, there are many details I’m missing. The general information either leads me in too many different directions or down a dead-end. Passing references to restaurants that have been lost with time. The addresses of buildings no longer in existence. I sense I’ll be left with many questions. I might never find out if Raymond gets married to one of the many women he consistently spends his evenings with or what becomes of him after 1923, but the journey is part of the fun. I never knew about the Hotel Theresa in Harlem; or the fantastic entertainment complexes that populated the Times Square neighborhood. It was also a pleasant surprise to discover the existence of a prolific female playwright — one who seemed to be writing about what she wanted and was successful at it to boot. I’m learning a lot, but mostly I’m learning to be patient; to deal with not knowing every detail and being ok with that. It’s the happy accidents and little gems of old New York , a glimpse of what it once was, that thrill me the most.